Enabling a new generation of service infrastructure that benefits from transfer opportunities that occur when people carrying communicating mobile devices meet. We will enhance existing ubiquitous service providers� networks by considering end-users to be part of the infrastructure. This topic is hotly debated in the research communities through the DTN (Delay Tolerant Network) acronym or the Opportunistic Networking one. It supports the new paradigm that the Network is the People. Encouraging the creation of innovative services to mobile communities of users based on new business models. With this regard, by federated academic and industrial efforts in this domain, it will help French companies to be position as leaders on different markets such as mobile services, hybrid (wired and wireless) access networks, content distribution and user community based information sharing platforms. Sharing electronic content from Wi-Fi hotspots in the street, and, under the user�s control, propagating it further from device to device. 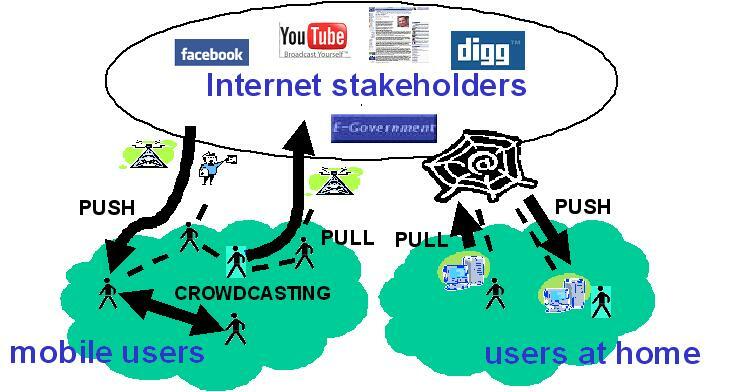 Supporting crowdsourcing and crowdcasting, enabling mobile phone users to become direct source of information, as observed in 2005 when the Katrina hurricane hit New Orleans. To progress beyond the state of art, we will define an architecture fully integrating publish/subscribe and opportunist communication paradigms. Research will be conducted to provide optimized mechanisms for data dissemination among mobile users, relevant community management and incentive mechanisms, and efficient quality of service and security solutions. Experimentations on the 20MIN mobile platform will ensure the validation of these mechanisms and of the architecture.